Since many of us have a long holiday weekend in front of us, I searched for some decor images to put us in the patriotic mood. I did most of my growing up in the 70's and I remember being at a classmate's home that had the coolest and funkiest red, white and blue basement. This was right around the time the bi-centennial took place in 1976 and Americana was IN in a big way. This basement was a kid friendly, fun place to hang out in. I didn't find some pictures quite as funky as that 1970's basement, but I did find some wonderful spaces. 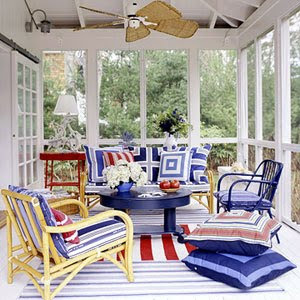 I love this colorful porch I found at Better Homes and Gardens. Who wouldn't want to relax in this outdoor space. 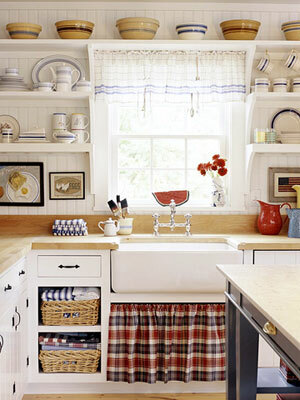 Here's a couple of kitchens dressed perfectly for the Fourth of July. The first image is from Better Homes and Gardens and the second is from Elle Decor. I love this casual dining space from Coastal Living with a nautical theme. Isn't this a wonderful built-in I found on Coastal Living? I could curl up with a book here and read all day. 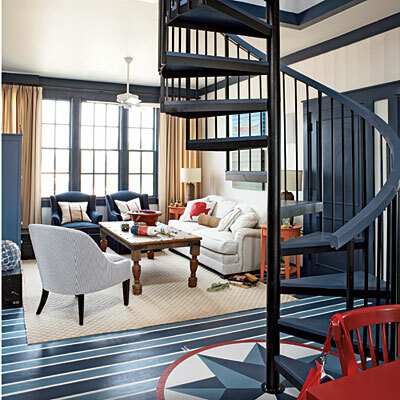 I love the painted floor in this Coastal Living living room. This is a fabulous country casual space from Better Homes and Gardens. I could see myself hanging out in front of this cozy fireplace all year long. 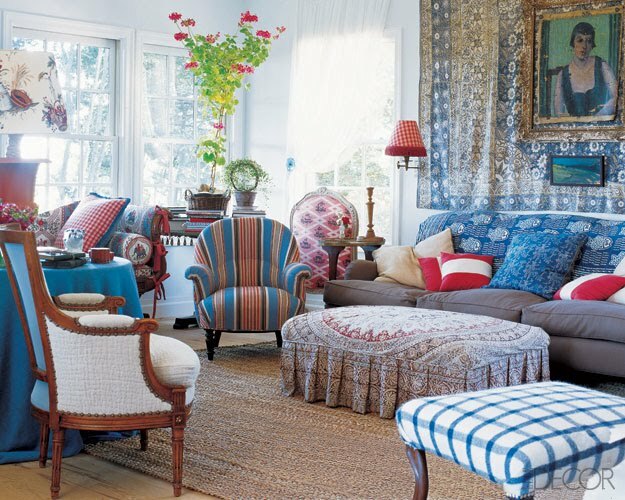 I love the mix of fabrics used in this Elle Decor living room. 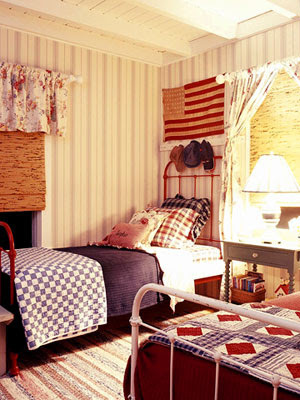 Of course bedrooms are the perfect place to use the Americana theme. It works equally well in a boy's or girl's room. A guest room would be a lovely choice too for some wonderful country quilts to build this look around. 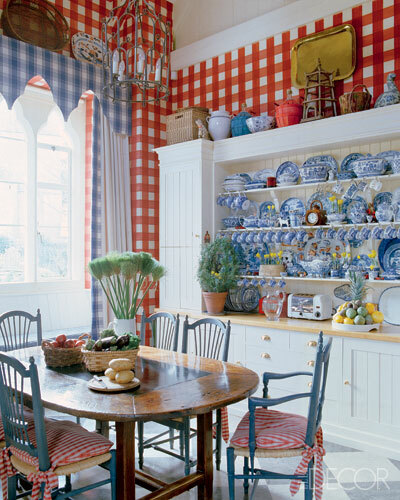 Red, white and blue doesn't always mean Americana or nautical. 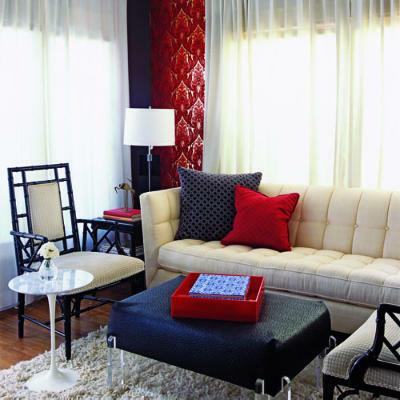 Here's a couple of pictures from Sunset magazine showing how this color scheme can be used in a more sophisticated space. Have a wonderful Fourth of July! It is time to reflect on how lucky we are as Americans to have the freedoms that we do and how blessed we are to have the men and women who serve our country to protect those freedoms. God bless them.